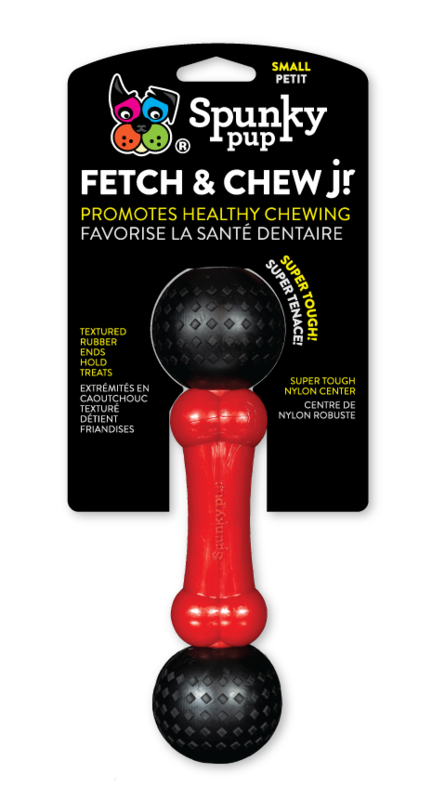 Great for tough chewers, the Fetch & Chew bone from Spunky Pup is made of a super tough nylon center with ends made of 100% natural rubber. The textured rubber promotes dental health by cleaning and stimulating your dog’s teeth and gums. Place his favorite treats inside either end to keep your buddy entertained as he tries to retrieve them. For large dogs. – Super Tough Nylon Center. Rubber ends Constructed with the most rugged grade AA supplementary double walled Natural Rubber from Hevea Brasiliensis trees.